Hi everyone! 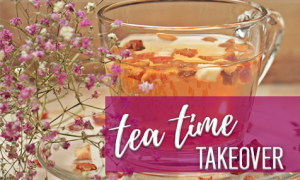 I’m Heather McCollum, and I’m so excited to celebrate my new Scottish historical release by talking about my favorite drink – TEA! I grew up drinking warm cambric tea, which is mostly milk and sugar, with only a little bit of actual tea (appropriate for a 5-year-old). My mother and grandparents always had a kettle heated on the stove and sat around the kitchen table, sipping and talking. My grandfather, a Polish survivor of the holocaust, liked his tea very sweet. He would hold a sugar cube between his teeth and drink the tea through it. 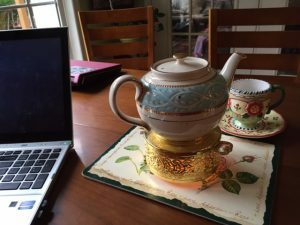 Whether news was joyous or terrible, the first thing we did was heat the tea kettle. My favorite tea is still plain orange pekoe black tea (which doesn’t taste like orange at all) with real sugar and half and half. But now I must also have a hot chai latte every day in order to write. The cinnamon taste lures my muse out of hiding. It’s become a crucial part of my writing process. I also love the atmosphere and ceremony around the brew. I try to pull out my china tea pot and cups at least once a week. I invite my 10 yo daughter (who loves tea too) to have a small tea party, because it slows us down. One cannot rush about when moving bone china cups, balanced in their saucers, and hot, delicate tea pots. So we take a breather and sit, daintily pouring, stirring and sipping. It’s a chance to talk of plans and dreams, a chance to step out of the busy rush of the world. I’ve been to many tea parties. 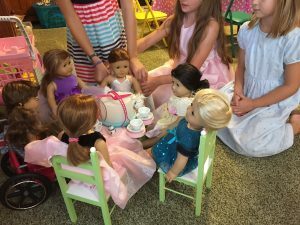 My daughter and I attended a tea at the American Girl store in Washington DC. Three tiered plates filled with finger sandwiches, scones, strawberries and cookies made a delicious centerpiece. 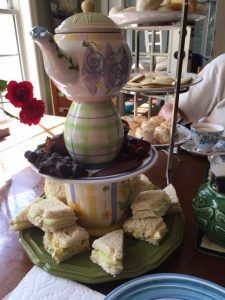 I’ve hosted tea parties at my house for large groups and small groups. My mother and I attended an Agatha Christie tea at our local community theater and a Silver Tea, hosted by a group celebrating their English heritage. You might think I’m a bit tea obsessed (and I’m not even British). I suppose I am, but what draws me to this tradition is more than delicately-flowered, curved tea pots and crustless sandwiches. The warmth of the drink, the slowing down, the soft clink of the cup on the saucer, the miniature, selected snacks – they all add up to something comforting. And in this world, taking a moment of comfort can center us to deal with whatever life throws at us. Do you take tea? What is your favorite tea or tea snacks? Below is my from-scratch recipe for Chai Tea Latte. Enjoy! Put milk and water in medium saucepan. Add cinnamon, cardamom, cloves, peppercorns, anise pods, ginger, and sugar. Bring to boil (watch close so it doesn’t boil over), then simmer for 5 minutes on low heat. Turn off heat, add tea leaves and steep, covered for 2-3 minutes. Strain out spices, then enjoy! Serves 2. Waking up not knowing who she is or where she comes from, Rose is at the mercy of the man who found her. Unable to speak from the swelling around her throat from a rope tether, she learns as much as she can about the new world around her and the powerful, sword-wielding Highlander who has sworn to protect her. Through dreams and flashes of her past, Rose begins to rebuild her memories. 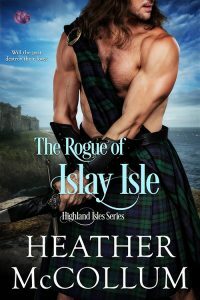 But the more she recalls about the horror she escaped, the more she realizes the jeopardy she is bringing to Islay, Clan MacDonald and the Highlander who has captured her heart. Heather McCollum is an award winning, historical paranormal and YA romance writer. She earned her B.A. in Biology, much to her English professor’s dismay. 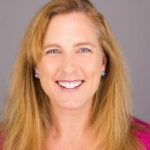 She is a member of Romance Writers of America and the Ruby Slippered Sisterhood of 2009 Golden Heart finalists. The ancient magic and lush beauty of Great Britain entrances Ms. McCollum’s heart and imagination every time she visits. The country’s history and landscape have been a backdrop for her writing ever since her first journey across the pond. 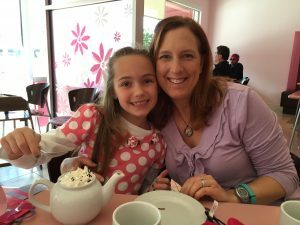 When she is not creating vibrant characters & magical adventures on the page, she is roaring her own battle cry in the war against ovarian cancer. Ms. McCollum recently slayed the cancer beast and resides with her very own Highland hero, rescued golden retriever & 3 kids in the wilds of suburbia on the mid-Atlantic coast. Hi Heather! I was interested to see you say a certain type of tea brought forth your muse. For me, it’s green tea with or without lemon. The reason is that I associate it with a writing course I went on in Bath, where, because of the lack of soya milk, I had green tea black (if that’s not a contradiction in terms!). One of the nicest teas I’ve ever had was white tea with elderflower- but the place I bought it no longer stocks it. Damn! I feel an internet search coming on!